This convertible pendant brooch dates from the Edwardian era, named for King Edward VII, eldest son of Queen Victoria, who ruled the United Kingdom from 1901 to 1910. High style jewels dating from this period, of which this piece is a superb example, share distinctive design, material, and technical features. 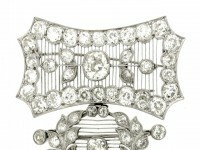 The 'Edwardian' style is among the most popular in antique jewellery today. In terms of style, fine Edwardian jewellery is perhaps most characterized by its delicate femininity, with designs inspired directly from late eighteenth century French architecture and decorative arts. This fascination with the ancien régime, particularly the reign of Louis XVI, has its roots in mid-nineteenth century revivalism, this particular vein popularized by the Empress Eugénie's romanticization of her ill-fated predecessor, Marie Antoinette. This alliance was no doubt in part propagandistic, intended to establish the legitimacy of Eugénie and Napoleon III by way of association with the French monarchy. Eugénie commissioned jewellery copied directly from Marie Antoinette's alleged jewels, as well as jewels in the 'style Louis XVI'. Brooches made by Baugrand for Eugénie in this mode were exhibited at the 1867 Paris Exhibition, which aided in spreading the style on the international level. Though not yet waning, the Louis XVI style was bolstered via the Paris Exhibition of 1889the centennial of the outbreak of the French Revolutionwhere jewellers such as Boucheron exhibited designs under the same stylistic description. Around the same time as Edward's ascension to the throne, the house of Cartier took up the Louis XVI style in earnest, putting their own distinctive spin on it. Jacques Cartier encouraged his designers to go out into Paris and sketch architectural elements such as boughs, laurel wreaths, and ribbons from eighteenth century buildings, resulting in what is now often referred to as the 'garland style'. What further distinguishes high-end Edwardian era jewels is a confined selection of materials, namely a preference for all things whitediamonds, pearls, and platinum. By the turn of the century diamonds and pearls were already firmly established as the king and queen of gems, however platinum was just making its widespread entrance onto the jewellery stage. New innovations in technology at the end of the nineteenth century allowed for this hard metal to be more easily fashioned into jewellery. Due to platinum's strength, jewellers were able to create designs vastly more delicate than in silver or gold. In addition, unlike silver platinum possesses the added benefit of being tarnish-resistant, making it an ideal mount for colourless diamonds. Some of the most impressive examples of jewellery from this period display new piercing techniques made possible by the strength of platinum, by which various intricate openwork designs such as honey comb, lace, and parallel 'knife wire' patterns were achieved, the latter of which can be seen in the present piece. Millegraining was also a key feature of this style, the minute beading used to hold stones almost imperceptivity in place. The result of these innovations was craftsmanship of unsurpassed delicacy, rarely if ever replicated today. This luxurious style was readily adopted by the court of King Edward VII, a man who was particularly known, even for an heir apparent, for living a life of lavish leisure, as he was precluded from political activity for the majority of his life by the extended reign of his mother. In contrast to the gravity of Victoria's court, due to her devotion to the practice of mourning, a backlash against such restraint seemed to further encourage the style. Alexandria, Queen Consort, the centre of British court life and consequently a fashion plate for the world, was often photographed covered in multiple strands of pearls and large, convertible diamond and platinum jewels. One of her first was commissioned from Garrard's in 1888 on the occasion of her twenty fifth wedding anniversarya platinum tiara set with 488 large brilliant cut diamonds. Once she ascended the throne she was free to attempt to rival the lavish crown jewels of her sister, Dagmar, who became the Empress Maria Feodorovna of Russia upon her marriage to Tsarevich Alexander III. Alexandra commissioned numerous diamond and platinum jewels from Europe's finest jewellery houses, including Cartier, Garrard, and Child and Child, the maker of this piece. Charlotte Gere and Judy Rudoe, Jewellery in the Age of Queen Victoria, London: The British Museum Press, 2010. Vivienne Becker, Antique and Twentieth Century Jewellery, London: Gemmological Association of Great Britain, 1987.